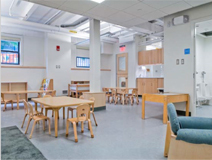 additional restrooms to meet building code requirements and NAEYC standards, new finishes and lighting, relocated directors' offices located near main entryways, and direct access to playgrounds. Vanserg and Shannon are connected two-story wood frame buildings which previously included these two child care centers as well as office space for various Harvard organizations. The renovated HYCCC space encompasses approximately 3,000 square feet, while the renovated OSDC space includes approximately 8,500 square feet, for a total of 11,500 square feet. From the early stages of conceptual design, the project team was focused on achieving sustainability objectives by reducing energy use while maintaining occupant comfort within the space. Much of the success of the project can be attributed to early involvement and engagement from a wide range of stakeholders with a strong commitment to green building process and principles - with a particular focus on providing healthy indoor air quality for the project’s little occupants. LEED for Commercial Interiors (LEED-CI) v2 Gold certification, which was achieved, was a primary project goal from the onset of the design.